I cannot teach creativity. I cannot teach my English language learners how to become creative individuals. Creativity comes from within. I cannot teach creativity. And while sometimes I wish I could simply stand in front of my class and bestow whatever creative capacities they desire, I do not have that power. Teaching, no matter how inspirational, does have its limitations. Although I may not be able to directly teach creativity, I can increase the likelihood that my students unearth their buried potential. I can build a safe learning environment to ensure that my language learners feel comfortable enough to reveal extraordinary sides of themselves. I can model my own creative processes for them so that they can see what different forms of creative expression look, sound and feel like. I can intentionally design and implement instructional approaches that provide opportunities for creative inspiration. As Alan Alda said, I can help them to discover themselves. While all of these efforts provide no guarantees, they do increase the likelihood of success. When working with young learners, it is of the utmost importance that the classroom environment is one that makes them feel safe and where they feel their opinions are valued. Without the establishment of a safe learning environment, authentic learning opportunities will struggle to take root. The need for this safe space is especially true when working with learners whose first language is not English. Authentic learning takes places when new information is presented just beyond an individual’s knowledge base, requiring them to take a risk in order to attain new knowledge. The famous Educational Psychologist Lev Vygotsky refers to this as a student’s Zone of Proximal Development, or ZPD. Every student has a different ZPD based on their background knowledge, previous experiences with teaching and learning and other outside factors such as family attitudes about education. However, in order to access the information placed at the cusp of their understanding, students must take a risk. This risk may be academic or social. For example, in order to begin processing long division, a student must first stumble through a few problems. Each miscue resonates within the individual until they have enough practice to master the skill. It is only after this foundational skill has been solidified that the learner can construct new knowledge upon it. A shaky foundational understanding often leads to weak and unsustainable constructions of new knowledge. Social risk taking can also be thought of using the ZPD model. During the final week of Ramadan, the holy fasting month observed by Muslim communities across the world, I presented a new instructional strategy that had brought me incredible success in my American classrooms: drama. While there had been other opportunities to utilize this approach earlier in the year, I did not feel that my students were comfortable enough to take the social risks necessary to solidify their understanding and bolster our relationship. When I first arrived at SMK Badak, I hoped my students would jump at the idea of conversing with a friendly native English speaker. It was only after I was in class for a few days that I realized the acclamation process would take much longer than any other class I had worked with in the past. After allowing my students ample time to familiarize themselves with me and my teaching style, I felt they were comfortable enough to begin opening up to me. Drama is an excellent instructional approach in the language learning classroom because it values student interpretation and creativity. In addition, drama caters to students with different intelligences. As Dr. Howard Gardner’s theory of multiple intelligences helps us recognize, not every student learns in the same way. Some individuals, myself included, possess a strong linguistic intelligence. In the classroom, we excel in learning tasks that require them to speak, write or generate opinions. Drama provides an opportunity to cater to those students who are bodily kinesthetic learners. These students enjoy demonstrating their learning through physical movement. New learning opportunities can bring out the best in students. I guided their thinking by asking them to compare the script in front of them with other texts they had come into contact with over the past year. I then asked them to share their thoughts with a partner, emphasizing that their conversations should center around the similarities and differences of the drama with other forms of text they had experienced. After the students had a chance to share their thoughts in partnerships and small groups, I brought the class back together. As a whole class, we walked through the script and I encouraged groups to share their observations. I recorded the students’ comments on the board. To truly spark my students’ creative minds, I provided a brief “trailer” of what a drama centered on each of the three themes could look like. This modeling, although it was somewhat uncomfortable and led to quite a few slip ups on my part, was essential in showing my students that I was equally as committed to these dramas as they were. Ouch! One member of this group was clearly tired of asking politely and opted for a more physical approach to convey her point. In addition to the establishment of a safe and welcoming classroom environment, I have found that modeling desired behavior is an effective motivator. In the language learning classroom, encouraging students to work in their second or third language is incredibly intimidating. One way to establish a strong rapport with students is to show them how dedicated you are to their learning. As the saying goes, “Actions speak louder than words.” This is especially true when your words are often lost in translation. A few rules I have learned to live by when it comes to modeling desired behaviors and outcomes in the language learning classroom. First and foremost, check your dignity at the door. If you want students to take risks in English, you need to take risks yourself. Do not be afraid to make mistakes and embarrass yourself in front of your class. These moments of initial embarrassment are beneficial to you and your students. A mistake is an excellent opportunity to highlight the learning process. Authentic learning is the rest of learning from mistakes. More importantly however, making mistakes shows you are far from perfect. 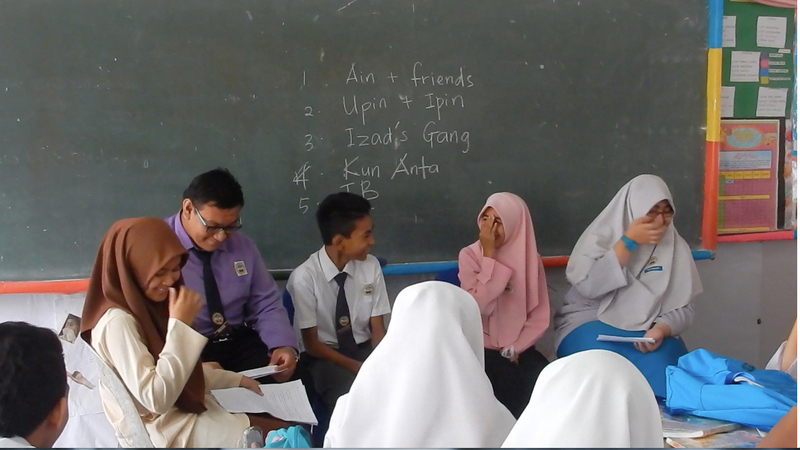 Many of my students at SMK Badak possess the necessary English language skills to participate in class, yet they are terrified of making a mistake and losing face. As their teacher, I take every opportunity to try new teaching strategies knowing that I will, in all likelihood, make a mistake somewhere along the line. In the same way that seeing your students outside of school provides a powerful moment of realization, so too does witnessing their teacher mess up, become embarrassed and then turn that mistake into something positive. Once I finished acting out my four “trailers,” I set the students free to work on their scripts. This type of student-led instruction was new to my classroom of learners at the beginning of the year. Up until I entered their class, they had learned English though language drills and grammatical lessons from a textbook. When I work with my language learners, I encourage them to take control of their learning: I ask them open-ended questions, I encourage them to work with partners or in small groups, I let them struggle with new tasks and refuse to simply give them the correct answer. This approach to teaching and learning is intentional and is used to encourage student creativity. Chivalry is not dead in Mr. Max’s class. While my students were working on their own scripts, I was busy working the room. I made sure to check in with every group multiple times over the course of the period to answer any questions they had regarding my expectations of them and to articulate my appreciation of their collective efforts. As the period came to a close, I reconvened the whole group and asked them to reflect on the day’s activities. “What were their greatest challenges today? Had they created a drama they were proud of? How did they find the experience of drafting a script?” We shared our collective opinions before dismissing for the day. Before I left, I told my students that I hoped to have them begin presenting the following period. Walking into our class the following day, I was admittedly nervous. I couldn’t help but wonder if I had asked too much of my students especially considering their lack of experience with script-writing and drama in general. I should know by now to never underestimate my students. At first, I wasn’t sure if I had indirectly contributed to my student getting slapped in the face! After further review, thankfully they are both very convincing actors! Their performances were spectacular. I was immediately taken aback by their creativity. Despite the fact that much of their day-to-day educational experiences are textbook examples of direct instruction, their dramas were phenomenal. Each group created an entirely unique script even though a few chose the same theme to focus on. Additionally, I was encouraged by their grasp of both conversational and academic English. All of the groups were able to successfully act out their drama and some were even able to infuse moments of humor. However, the highlight of the day was entirely impromptu. If you live in Malaysia, what do you do when Justin Bieber comes to your school? You take a selfie of course! 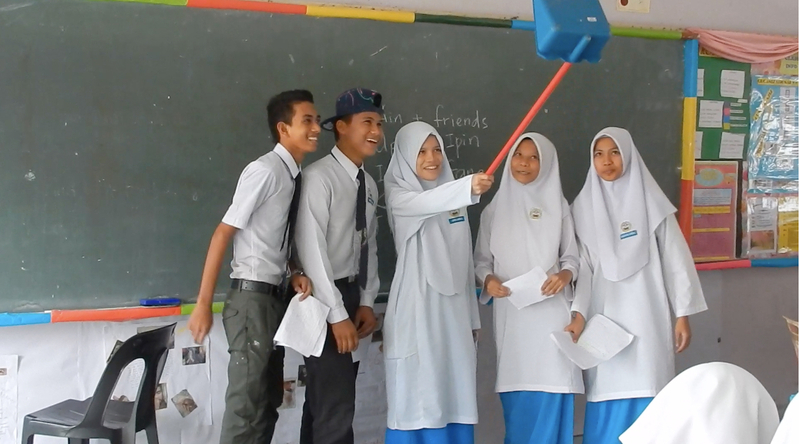 During their performance, one of the actors casually exited the stage, walked to the back of the room, retrieved the dustpan, returned to the stage, gathered J-Biebs and his crazy fans from SMK Badak and snapped a selfie using the dustpan as a selfie stick. What creativity! What cinematic gold! Sitting in the back of the class, I was inspired by my students willingness to commit so wholeheartedly to a new learning task. This experience highlights the importance of providing students with diverse learning opportunities that showcase their passions and talents. It is easy to underestimate or label language learners because of their hesitancy to participate or take risks in class. However, this lesson also proves that with enough time and encouragement, they can tackle any challenge. Start from day one – Inside the classroom, respect is earned not given. It is of the utmost importance that, as a classroom teacher, you clearly articulate your expectations and goals from the very beginning. While students should be involved in aspects of this process, such as establishing classroom rules, teachers must take the lead in embodying the approach they want their students to take. In my language learning classroom, I made sure to articulate the importance of risk taking and growing from mistakes. As I teach new concepts, I make sure to intentionally make mistakes and “think aloud” as I process and grow from the experience. For my students, seeing me make mistakes and noticing that I won’t punish them for grammatical or spelling mistakes was an incredibly powerful realization. Their learning has taken off as a result. Praise effort, not the outcome – There is so much research out there right now discussing “growth” verses “fixed” mindsets. In a recent article published in The Atlantic, researchers have successfully linked students who are told they are “smart” with an unwillingness to make mistakes or attempt challenging tasks. Praising the end result is a disservice to the learning process. Teachers should recognize their students’ work, but they should focus their praise on the effort and mistakes they made to get there. As Carol Dweck, one of the world’s leading mindset researchers says, a “growth mindset” within each student is the ultimate accomplishment for the classroom teacher. For my language learners, I implemented a weekly journal program to help bolster their confidence levels and willingness to make mistakes. Every week, my students receive a new prompt to process for one week. These prompts vary greatly and are meant to encourage extended writing and student creativity. I do not mark the journals for mistakes, but I do respond to every journal entry. This activity has transformed my classroom and I will publish a post dedicated to the impact of these journals in the near future. Stay tuned! Take the time to get to know your students in and out of the classroom – This does not necessarily mean hanging out with your students outside of class, although that may be appropriate depending on the age of your students. This process can occur within the classroom as well. Encouraging students to conduct interest surveys at the beginning of the year is a safe, easy and enlightening way to get to know your students likes and dislikes in school and beyond. Take risks, but only when your class is ready – This was the hardest concept for me to grasp. Sometimes, my energetic personality carries over into my teaching. Even now-and-again I find myself speaking too fast because I have let my excitement overtake my mind. When I arrived at SMK Badak, I thought I would be able to win my students over simply by being energetic and asking them to participate in new activities. I tricked myself into thinking that, solely because I was a Western teacher, my students would blindly follow my every wish. Reflecting back on my first few months in Malaysia, my energetic approach probably hindered my progress. I had forgotten that a positive rapport is earned over time and not simply awarded to an individual. As I mentioned earlier, I had planned on implementing drama much earlier in the year and I am thankful that I did not follow though my initial plan. My students were not ready for such a task. They were not comfortable enough with me nor with my student-centered teaching approach to truly benefit from the experience. I learned from my initial mistake and my students excelled as a result of my new-found patience. After leaving for the day and while reflecting on the activity as a whole, I began to receive WhatsApp messages from co-teacher. 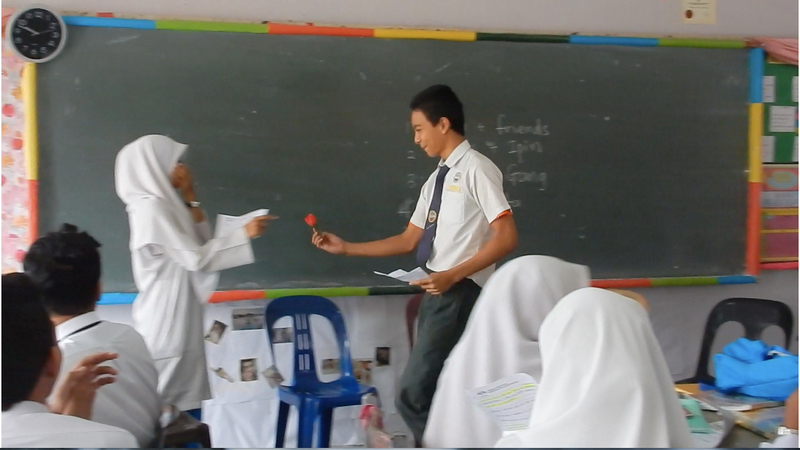 She was in the room throughout the activity taking photos and recording video of the students as they presented. Flipping through her photos, it was impossible not to smile. I was immediately back in the classroom with my students, reliving the day’s successes. However, after flipping through four or five of her photos I had to stop and sit down. Looking down at my iPhone screen I saw something that I had never seen before: one of my student’s smiles. I sat in my living room and started at the photo in silence, fighting back the tears that were nearly inevitable. This is why I teach. Moments of joy like this. Sometimes the teaching profession can break one’s spirit. All of the meticulous planning, personalization and dedication can feel as if it has gone unnoticed. This feeling may be short-lived or it may seem to drag on forever. But when the moment finally does come to an end, and is replaced with truly inspirational experiences, the relief somehow makes all the pain and suffering inconsequential. Pure cinematic gold. Never underestimate your students. Previous Post Mr. Max, Why You Gotta Be So Rude?